This brooch of flowers in a basket is made of diamonds set in silver with a gold backing. The diamonds on this brooch are so numerous and so large that for a time, it was thought that the diamonds were fake and made up of a type of fake stone known as paste stones, which was popular for jewelry made in the eighteenth century. Brooches such as this, in real or fake stones, were used to add a decorative element to ensembles. Both men and women in the eighteenth century wore jewelry of this kind as part of their attire. Often they had sets of jewelry which would include pins, brooches, necklaces and rings that could be worn with various outfits. Women were more likely to wear a brooch in the center of their chest, at the neckline of their bodice, while men would have worn it on a lapel. Both men and women might have worn a matching necklace in addition to the brooch if it was part of a set. However, despite the vogue for paste stones during the eighteenth century, masses of set diamonds were typical for those who could afford them. Wearing items such as this was a way for the wearer to display their wealth and power. The use of diamonds in suites of jewelry, rather than colored gemstones, became fashionable first in France. However, as the French were seen as the arbiters of high style, the use of diamonds spread throughout Europe, which is why this brooch cannot be attributed to a specific country. However, the floral decoration and curving line of the brooch is characteristic of Rococo ornament, which allows it to be dated to the second half of the eighteenth century. Audrey Sutton is a graduate student in the History of Design and Curatorial Studies program at the Cooper Hewitt and a Fellow in the Product Design and Decorate Arts Department. 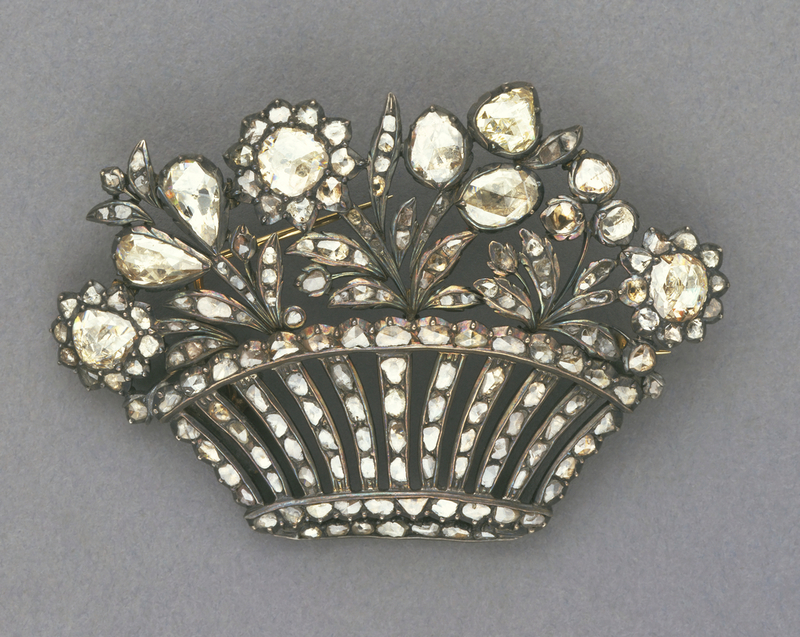 Brooch (England or France), 1750–1800; Rose-cut diamonds, cut silver, gold wire; Gift of Gertrude Sampson, 1962-26-1.